“Will the sun blow up when it dies?” I have been asked that question numerous times during a public program at Perkins Observatory. I inform them that no, the Sun will not blow up at the end of its life, but it will quietly live out it’s last days as a planetary nebula. The sun is an average, middle aged star. It has existed now for over 4.5 billion years. It should keep burning for another 5 billion years before it becomes a red giant, when the outer layers of the sun’s atmosphere starts to expand and the core starts to heat up and contract. After the red giant phase, the outer parts of the atmosphere will be thrown off due to thermal pulsations leaving a white dwarf at its center. This is the planetary nebula phase that most main sequence stars like our sun spends its retirement. Planetary Nebula are becoming my favorite objects to observe. They usually have a high surface brightness which makes them quite noticeable even in my suburban skies. Some favorites that can be seen this time of year include the Eskimo Nebula in Gemini, The Ghost of Jupiter in Hydra, or one of my favorites, NGC2438 that appears to lie in the open star cluster, M46. They are fun to hunt down due to their smaller size. I enjoy using my orthoscopic eyepieces to get nice, clear, high magnification views to coax out the smallest details. For example, this past Saturday evening, my observing partner and I were up at Perkins Observatory. I was using my 16″ scope and a 9mm University Optics Ortho, and noticed the bright ring in the Ghost of Jupiter. It was a great view! It was glowing a bright blueish-green. 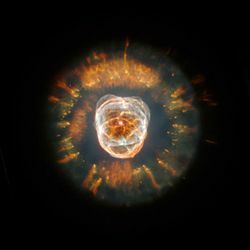 The Eskimo Nebula was showing nice detail in its core. So much fun! There are other great planetary nebula to view throughout the year. The Ring Nebula is one of the most famous. 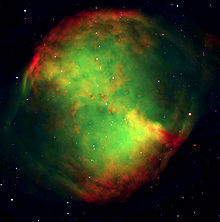 The Dumbbell Nebula is another. Some planetary nebulae appear to be blueish-green, but some are very blue like the Blue Snowball in Andromeda. An Oxygen III filter can sometimes reveal more detail or cause a faint subject really stand out. Others, like the Blinking Planetary in Cygnus, will blink out of view when looking directly at it. But when you look away, it pops into view! Planetary nebulae are fun to hunt down and enjoy. They represent the last stages of an average star’s life and have many different shapes and sizes represented. I hope you enjoy them as much as I do. ~ by jhissong on 2010/04/07.